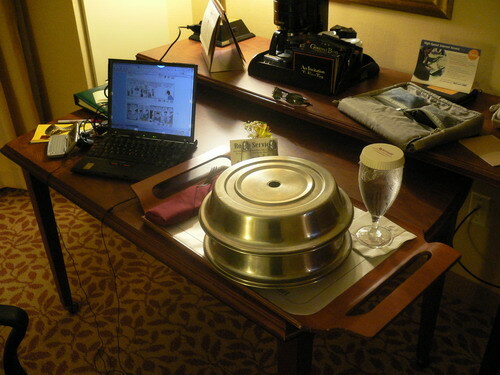 Before anyone gush "Wahhh.... room service... I also want!" Let me tell you that I would rather go out to eat with someone rather than getting stuck in the room eating all alone. Staying healthy with a grilled chicken caesar salad with coconut shrimp. What's going to America without eating american breakfast right? Burp! 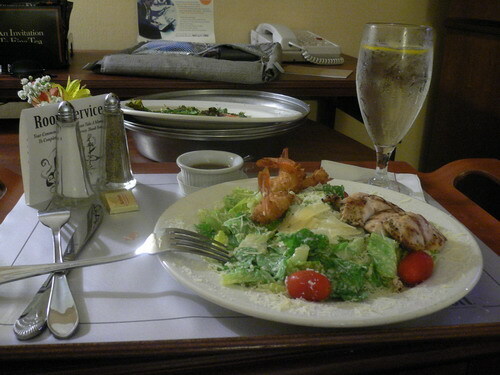 Seriously speaking, sometimes I prefer to stay in the room service rather than going out. sunflower: Originally, I planned to go downstairs to makan but once I checked into the room, I sian half about going down for dinner alone. 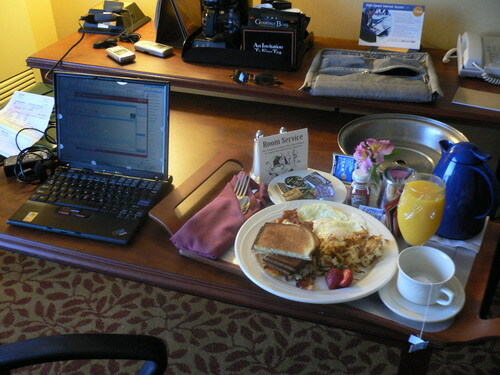 Hence the room service not only for dinner but also the subsequent breakfast. Kelly: Cup noodle damn leceh since the styrofoam cups would probably end up crushed. Cup noodles would still be dining alone. No? Anyway, given in US that the only way to get boiling water is the coffee maker, let me warn you that they probably hadn't wash it properly the day it was first brought into the hotel. Here's a test. Turn on the coffee maker without adding coffee powder. Let the water come to a boiling and drip into the pot. Now drink the water in the pot. Tell me if you can taste the coffee despite the fact that you didn't add any. I rest my case. The grilled chicken caesar salad looks damn delicious. I'm currently craving for salads. ahhh..
By the way, I never call room service 'cause I'm cheapo. muahaha..
haha.. i did this test before when go overseas with my family.. after that test, no one ever touch that coffee maker again..
OLLie: It is generally 20% more expensive then going downstairs due to the extra service charge. Gary: The lesser of the evil is go to the ice machine and drink water from the melted ice. Still that is tap water and old building plumbing can be quite the horror as well. Perhaps you can consider investing in a small travel kettle next time bah. my family rather spend the money to buy mineral water or ice than to DIY ourselves in the hotel.. imagine brownish water coming out from the tap..
Gary: Of course, mineral water better lah.. but you are assuming that there is mineral water available for purchase. Some of these dingy hotels/motels that I stayed are exactly just that. Given that in the US, you need a car to go anywhere at all, we were basically locked in and left to our own devices.